First off, a little tip for those of you who are new to the ways of vintage Singers. 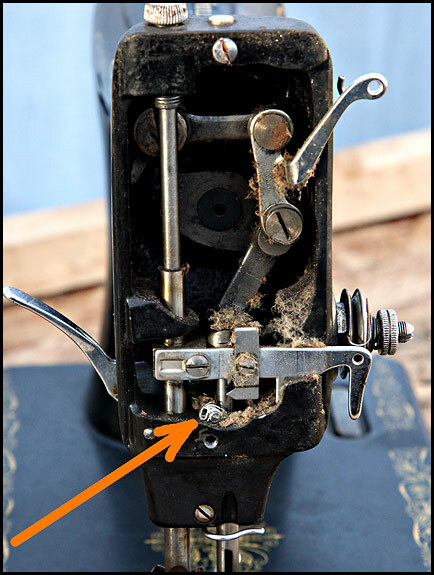 In order for the top tension adjustment to work properly, the two discs between which your thread passes on its way to the needle need to be able to “squeeze” it between them just like Mr.Singer intended. They can’t do that if there’s rust on the inside faces, and neither can they do that if there’s a buildup of fluff, lint or the grot of ages in there. 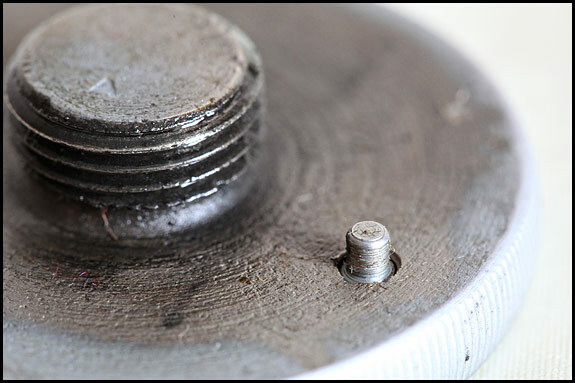 Assuming that the mating faces of the two top tension discs are clean and if not shiny, at least smooth, the only other requirement is that your thread actually passes beween them properly. And the way to ensure that it does just that is get into the habit of always raising your presser foot before threading your machine! When you raise it, the tension releasing pin releases the spring pressure holding your tension discs together, so that when you pass the thread round between them, it can end up in the right place – which it’s unlikely to do if the discs are pressed together. 1 Start with some tension on the check spring, but not much at all. If it does, all is well. If it doesn’t, you need more check spring tension. And if in doubt, more is better than less. And finally, if, for whatever reason, you’re beset by tension troubles, beware of one method of checking for correct tension which seems to be all over the internets. You may read that the proper way is to take a small square of medium-weight fabric, fold it, stitch diagonally across it, remove the piece from the machine, hold each end of the line of stitching and pull evenly until a thread breaks. Allegedly one of three things will happen. If your top tension’s tighter than the bottom, the top thread will break first. If bottom’s tighter than top, the bottom thread will break first. Or if both threads break together, your top and bottom tension are balanced (but not necessarily correct). If nothing happens, both tensions are supposed to be balanced but too loose. What nobody ever seems to point out is that unless you’re using identical thread top and bottom and those threads are cotton, this venerable test is about as much use as a chocolate teapot. Now, you’ll have to pretend a bit here, because that’s the only 185 motor I can find right now and when it came to us it had already been rewired. Badly. 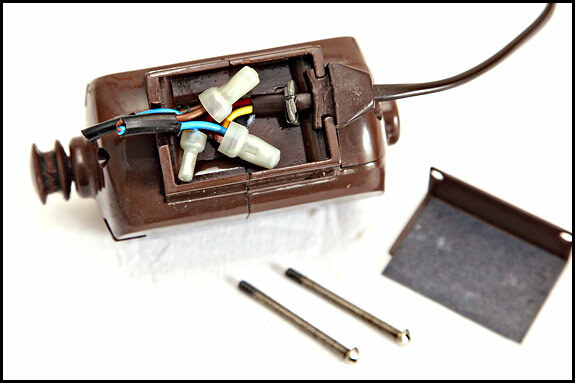 If it was still original, those two cut-off black cables on the left wouldn’t be cut off, and they’d be brown, and they’d have a brown plastic thingy round them where they come out of the terminal box under the motor, like the cable on the right does. I cut off those replacement leads to the mains plug and the foot controller when we bought this one in, but you can still see what a lash-up it was. That single cable going off to the right goes to the Singerlight, and it has its brown bush/sleeve thingy present and correct. The reason why the corresponding one’s missing from the left hand side is doubtless because whoever did the wiring found that it was, to use a technical term, stuffed. Those brown bushes harden with age, the lugs on them which keep them secure in the hole tend to come off, and when that happens, they are as much use as a chocolate teapot. There’s your plastic bush on the right with the Singerlight lead going through it, and you can see what I mean about those lugs. 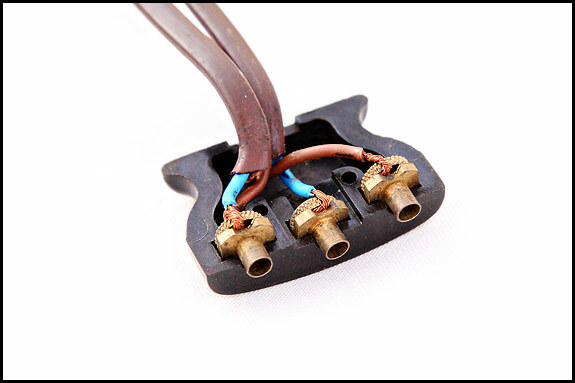 It won’t matter greatly if those particular ones come off because the lead to the Singerlight doesn’t generally get waggled about a lot, but the ones to the foot pedal and mains plug certainly do. That’s why they need one of those bushes round them, and also some proper strain relief. That light-coloured thing round the Singerlight lead just inside the bush is the original strain relief – a cunning little two-part affair made of fibreboard and a spring clip, which works well on the original flat twin cable but doesn’t work at all on anything else. It’s also a pig to remove and replace, unless you’re privy to a secret technique handed down across the generations by horny-handed sewing machine repair men. But what, you ask, are those off-white queerthings? They, dear reader, are Scruits, unless you’re in the States, in which case I think they’re wirenuts. But I’m not really sure. Whatever, they used to be a very common way of joining two or three stranded conductors together, and they work a lot better than you’d think. 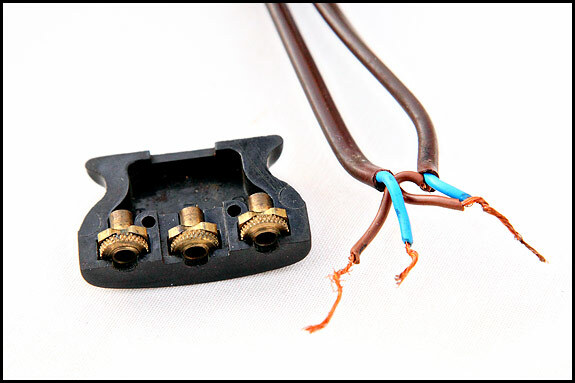 Basically all you do is strip half an inch or so of insulation off each conductor that you wish to join, align them alongside each other, and twist the ends together clockwise. 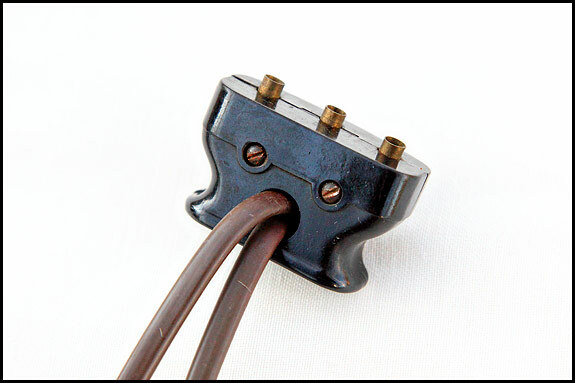 You then screw the Scruit on, remembering to twist it clockwise, and bingo – the metal inner of the Scruit tightens itself onto your wire ends and you have a secure connection. 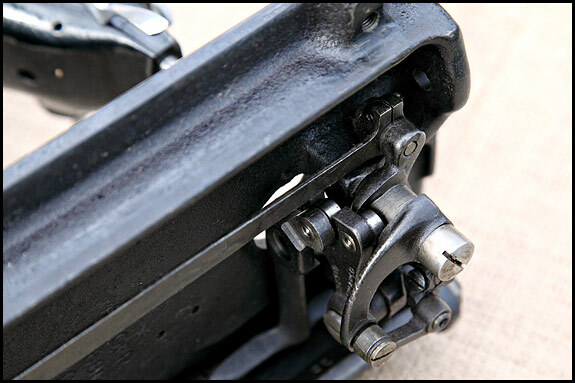 The Scruits in the picture are the later nylon-bodied type, and these particular ones have been crimped after they were screwed them on, presumably because whoever fitted them had no faith in the Scruit doing its job and no intention of ever undoing the connection. Earlier Scruits came in a truncated conical form made of hard black plastic, and earlier still they were porcelain. I like Scruits, I do, but then I was brought up when they were still widely used. 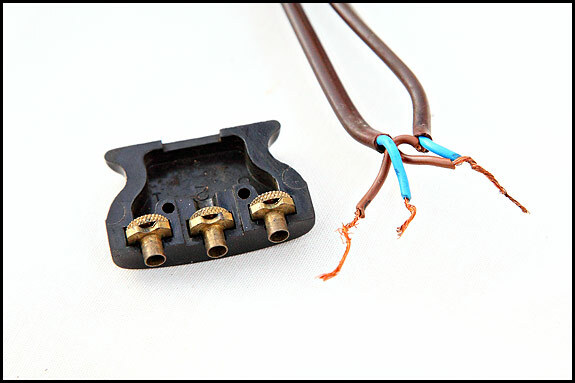 And that picture illustrates why re-wiring a 185K is seldom a straightforward business. It’s not the Scruits that’s the problem, but the lack of strain relief and of a suitable bush when you can’t re-use the original one. Frankly I have no suggestions as to how you might go about making a proper job of it in the absence of a re-usable bush. All I know for sure is that if we couldn’t rustle up a bush in good condition and also come up with an effective way of providing suitable strain relief for the new cables, we wouldn’t offer the machine for sale. 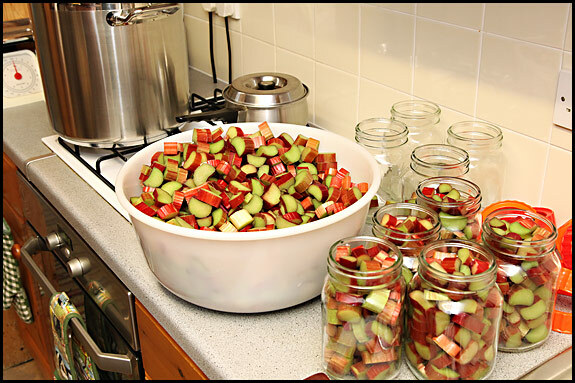 This year we’re trying out the water-bath method of bottling because Elsie’s sure it uses less energy than doing them in the oven, and rhubarb’s a good subject to test the method with because we’ll have an abundance of it for the next few weeks. 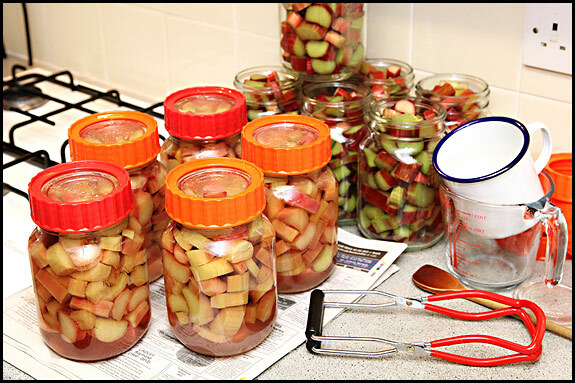 If we get any jars which don’t seal properly, we can always put them in the fridge for eating soon then just pick more rhubarb and try again. We’ll probably do another dozen or so jars of bottled rhubarb this coming week (each jar makes 2 crumbles), but we’ll also be making a lot of scrummy rhubarb and elderflower jam because judging by the look of the blossom, we’re not going to be making much damson this year. 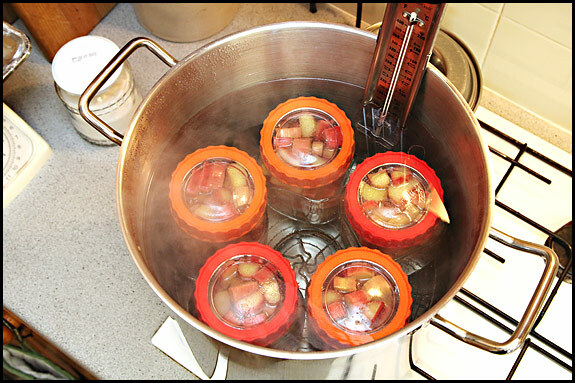 Finally though, a question for our American and Canadian readers about home preserving terminology. Where you are, do you guys call this procedure bottling, or is it canning ? And now … vintage Singer sewing books for sale! Gosh, I finally got it together to sort out a few spare copies of these wonderful Singer USA books and get them listed on the “Bits ‘n’ Bobs” page. They’re originals, they date from the 1930’s, and as far as I know they were never sold in the UK. 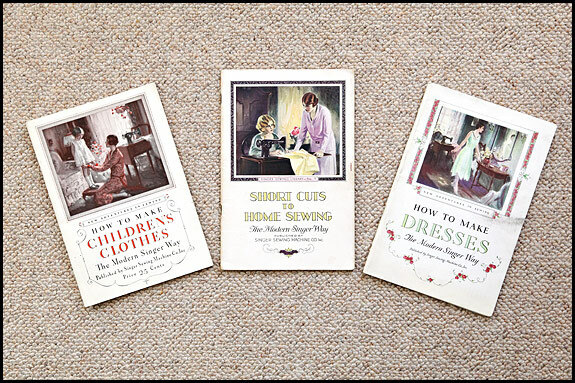 All three are fascinating reading – and if you’re at all into antique/retro dressmaking, they’re right up your street! She may have been a strange child, but in later life Mary BP certainly knew her stuff. 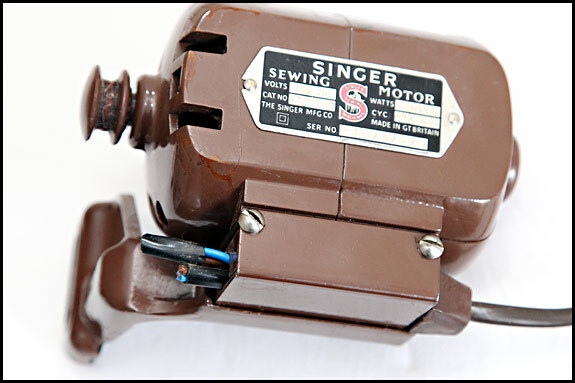 There’s oodles of invaluable information on caring for your Singer, including stitch formation and tension, oiling, common causes of machine troubles and so forth, as well as how to sort out your bobbin thread guide by the application of a pair of pliers! And after that, there’s everything (and I do mean everything) you need to become an expert user of the binder, the foot hemmer, the adjustable hemmer, the tucker and the ruffler, with plenty of excellent illustrations. “How To Make Children’s Clothes” is perhaps more of a nostalgia thing, unless of course you’re into making costumes for Amateur Dramatics. Having said that, though, it’s full of practical hints and tips which apply just as much now as they did 80 years ago – even if you don’t have an urgent need right now to rustle up a bloomer frock for a four year old. Difficult to put down once you start looking through it, this is may well be an invaluable little book for fashion students. “How To Make Dresses” is absolutely essential if you’re a student of fashion. You have to have it! You need it too if you’re a theatre costumier, or for that matter if you just have a thing about 30’s style. Good stuff on seams, using and altering patterns, assembling and finishing dresses, hemming and so forth, including period gems like the bit on “Clothes’ Becomingness”. Remember ladies, “a dress can rarely be smart that is not first becoming”. What follows relates to pretty much every standard domestic Singer electric sewing machine sold in the UK between 1930-ish and the mid-1960’s. 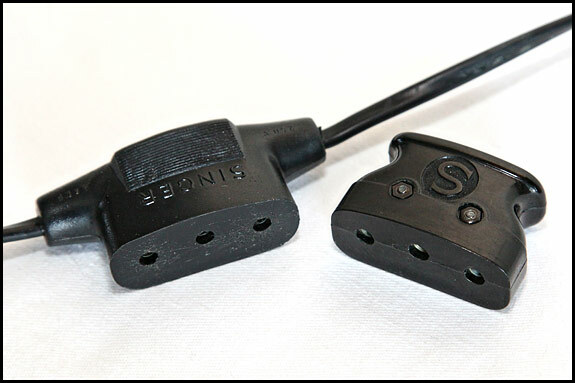 If your machine has a socket on it that takes a plug which looks something like these, we’re in business. 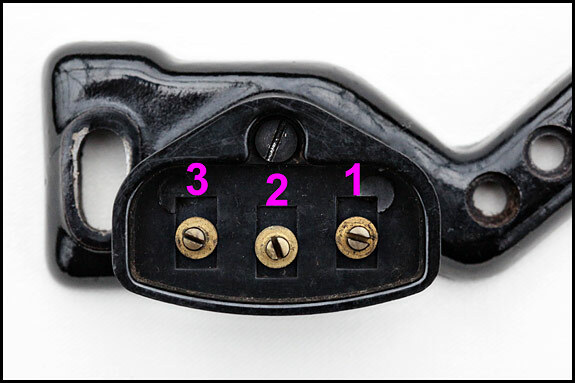 Obviously yours won’t be graced by those nice purple numbers, but we need them in the picture to show how the socket relates to the wiring diagram below. 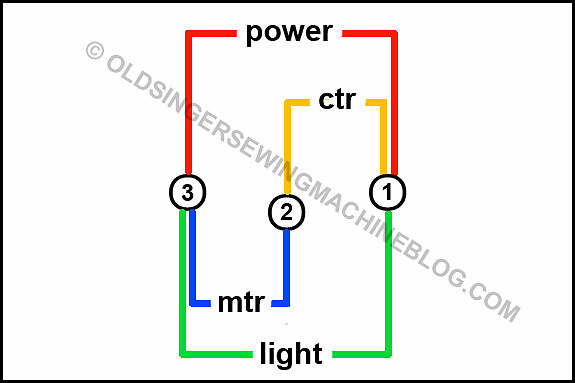 That’s the universal vintage Singer domestic wiring diagram in its simplest form, and you’re looking at it the same way as in that photo above. Sorry about the watermark, but it took me ages to do that diagram in Photoshop, and if people are still going to steal the image, at least now they can do some advertising when they use it somewhere else. In case it’s not obvious, “mtr” is motor, “ctr” is controller – and yes, it really is that simple! The practice might not be, but the principle certainly is. 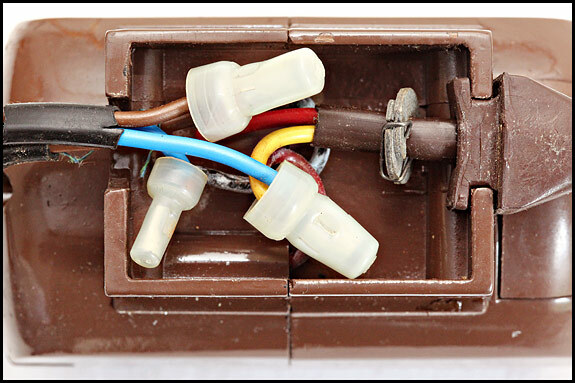 Note that the connections are usually numbered on the back of the socket, but often they’re not on the plug, so do check that you have everything the right way round before connecting to the mains. 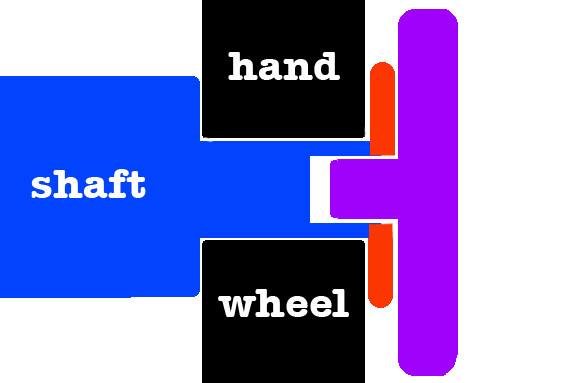 Following on from the last post, we’ll now look at how to replace the handwheel, or if you like the balance wheel, which is a process that can make no sense at all if you don’t understand what’s what. Before we get stuck in though, I need to stress that what follows applies only to the classic Singers with the big chromed knob in the middle of the handwheel. You’re on your own with anything more modern. As we said in part one of this epistle, the two projections on the inside of the washer locate it on the shaft, such that both shaft and washer always rotate together. But it’s those three sticky-outy bits on the outside of the washer that we need to concern ourselves with now, and in engineer-speak, sticky-outy bits like that are called lugs. That’s why in some parts of the country you hang your glasses on your lugs, and the orifice into which blokes insert their little finger before wiggling it theatrically is their lug ‘ole. But I digress. Except for one thing. The washer would be the other way up. 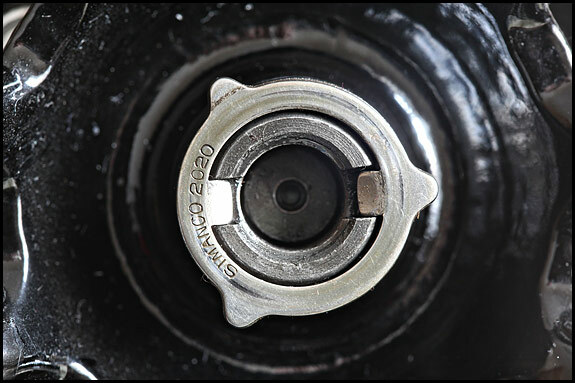 For clarity, I’ve taken these close-ups with the washer reversed so that it sits against the head of the screw. What you’re looking at there is the relative position of the stop screw and the washer when you’ve released the clutch in order to wind a bobbin. Remember that when you do that, the washer stays put on the shaft? Well, now you can see why when you de-clutch a vintage Singer, you can only unscrew the knob about a third of a turn. Yep, the stop screw comes up against one of those three lugs, and that stops you unscrewing it any further. That’s why it’s called the stop screw. Now, when you’ve wound your bobbin and you want to revert to normal sewing, what you do is screw your stop motion clamp screw in, i.e. you rotate it clockwise. You can be forgiven for now thinking “Ahah, so the stop screw hits another lug and stops me tightening it any further?” because that’s what it looks like in this next photo. But that’s not actually the case. In fact you tighten the knob until you’ve squashed everything together tight enough to squeeze up the slack and lock your handwheel to the shaft. 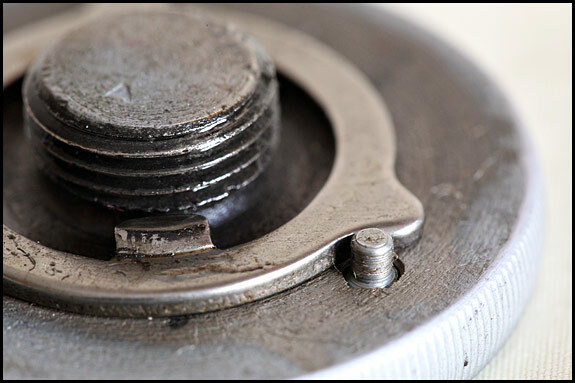 That’s what stops you rotating the stop motion clamp screw any further – not one of those lugs. 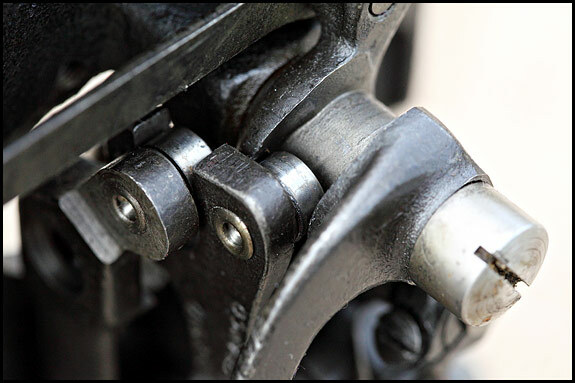 Everything needs to be clamped together by the stop motion clamp screw before you’ve turned it far enough forward for the stop screw to hit one of those three lugs like it has in the picture below. Gosh. At last we’ve arrived at how this all relates to which way round that washer (which, remember, is upside down in those two pictures) goes. To sum up the story so far, when we come to put everything back together, we need to meet two conditions. Things need to be so arranged that when we slacken the stop motion clamp screw, we can turn it anti-clockwise far enough to release the pressure on the handwheel so it becomes free to rotate round the shaft, but not so far that we risk the washer getting out of position. That’s the first condition. The second is we need to ensure that when we tighten the stop motion clamp screw, everything squashes up enough to lock the handwheel to the shaft before that little lock screw hits a lug. Fear not though, dear reader. All is about to be made clear. First of all it helps if we can increase the odds on the washer staying put on the end of the shaft while we screw the stop motion clamp screw back in place. The way I do that is to have the two slots in the end of the shaft horizontally opposed to each other, and if they’re not like that already, it’s just a case of putting a screwdriver across them like in the picture above and levering the shaft round to where we want it. What we do then is put the washer on the end of the shaft with the inside projections facing outwards, we check that the little stop screw isn’t protruding through to the back of the stop motion clamp screw, then it’s just a case of carefully screwing that back onto the shaft. 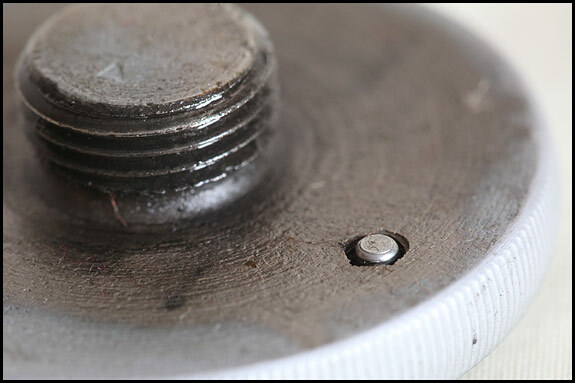 Screw it in as if tightening the clutch for normal sewing, then try screwing in the little stop screw. If it won’t go all the way in, don’t force it, because it’s telling you it’s not happy with the way things are aligned. In that case, back out the stop screw, remove the stop motion clamp screw and try again with the washer rotated 180 degrees round the shaft. 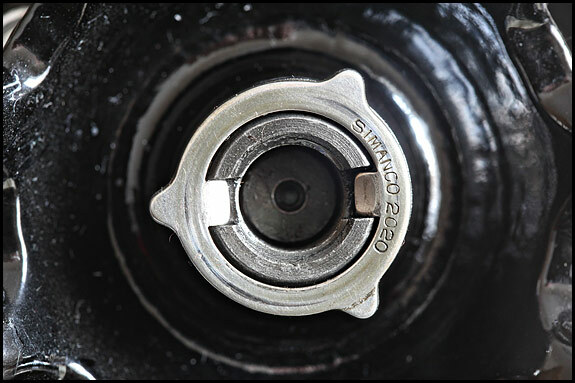 If the stop screw will go all the way in, hold the handwheel and turn the knob clockwise as far as you can. If that leaves you with a handwheel which is locked to the shaft, hold your breath and try unscrewing the knob as far as you can. If the handwheel rotates freely when you can’t unscrew the knob any further, it’s your lucky day. You got it right first time. You’ve met both conditions. Rejoice, put the kettle on and break out the stale shop-cake. If the stop screw goes all the way in but something (it’s actually a lug on the washer) stops you tightening the knob before it’s screwed in far enough to lock the handwheel, you need to try again. It’s a comfort to know that if everything worked properly before you took the handwheel off, it’s just a case of you getting that washer back on the right way and all will once again be sweetness and light. You have a 50% chance of getting it right first time. According to the old Singer parts lists, that big spokey wheel on the end of your vintage Singer is the balance wheel. 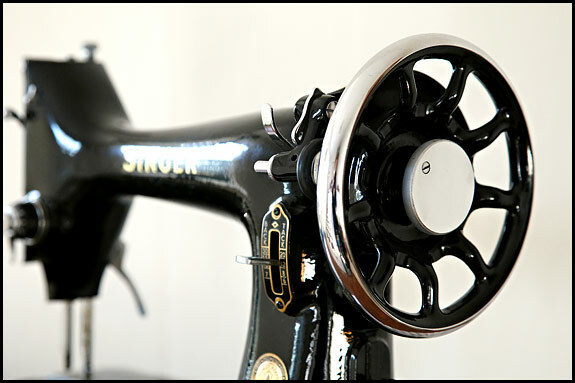 According to most folks who use a vintage Singer it’s the handwheel, so it’s the handwheel as far as we’re concerned here, and we’ll be looking at its removal and replacement, with a bit of a detour on the way. But why, pray, would anyone want to take the thing off? Well, you could be taking a machine apart because it’s in a disgusting state and cleaning it will be so much easier if you take off some of its bits. 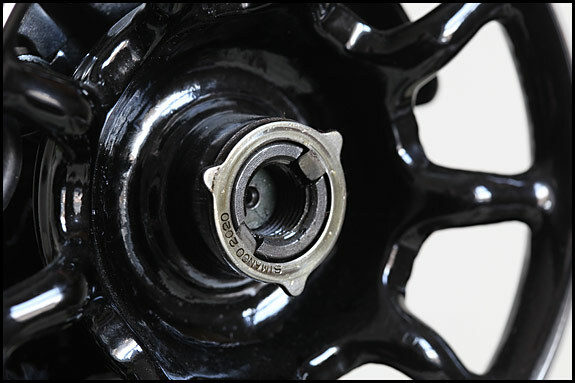 Or maybe you want to change the handwheel for a different one? You’re bored and it might be more interesting than cleaning the oven? Who knows. Whatever the reason, people do take their handwheel off. Oh yes. Then they put it back on, and the funs starts when they find that the clutch doesn’t work. Well, the clutch is what lives behind that big chromed knob in the middle of your handwheel, and without the clutch your machine would be nowhere near as user-friendly as it is. 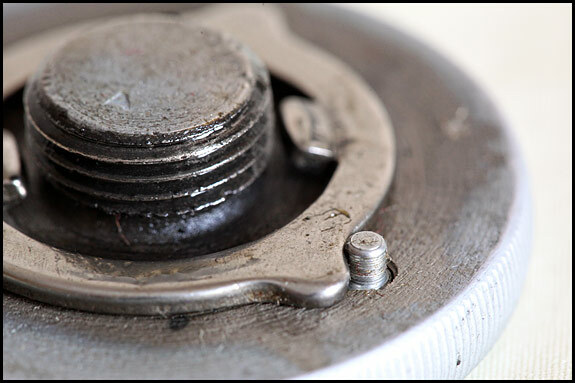 That chromed knob is what is properly called the stop motion clamp screw, and it’s called the stop motion clamp screw because that’s what it does. It stops the motion and it clamps things together. When you hold the handwheel and turn the stop motion clamp screw clockwise, as you do for normal use, it clamps the handwheel to the shaft onto which it’s fitted, so that when the handwheel turns, so does the shaft. On the far end of that shaft is the linkage to your needle bar, which goes up and down as the handwheel turns. That upping-and-downing is the motion, which you stop by unscrewing the stop motion clamp screw when you want to wind a bobbin. Unscrewing it stops the motion at the far end of the machine, so that your handwheel can drive the bobbin winder round and round without also driving the needle up and down. 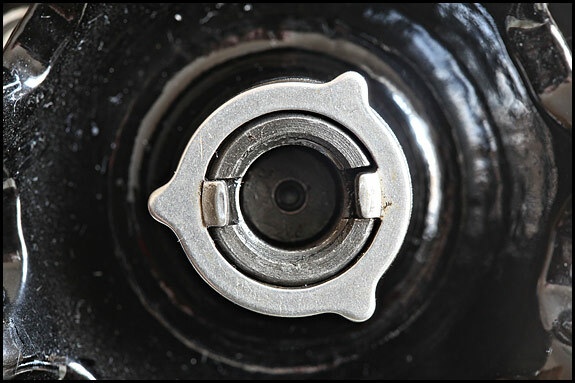 To do that, you need to remove the stop motion clamp screw, and you do that by first unscrewing that small screw in it. But don’t unscrew it too far, or it will fall out and roll under the table, you won’t find it, and next time you Hoover it’ll be gone forever. Unscrewed about as far as in that picture is plenty far enough. If you can now unscrew the knob, that’s what you do. The thread on it’s about 6mm long, by the way. If you can’t unscrew it all the way so that it comes off, back that little screw out another half turn and try again. So how does it all work then? Well, it’s one of those things which is a doddle to expain if you’re sitting next to me with a machine in front of us, but trying to explain it on the interweb is not so easy. Fear not, though, gentle reader. We’ll manage. Make yourself another coffee, maybe even grab a biscuit if you’re not still on the diet, then take what follows one sentence at a time. In the picture above, you’re looking at the end of the shaft which runs through the arm of the machine. Two projections on the inside of that washer engage with slots in the end of that shaft, so obviously when the shaft goes round, so does the washer. And vice versa. 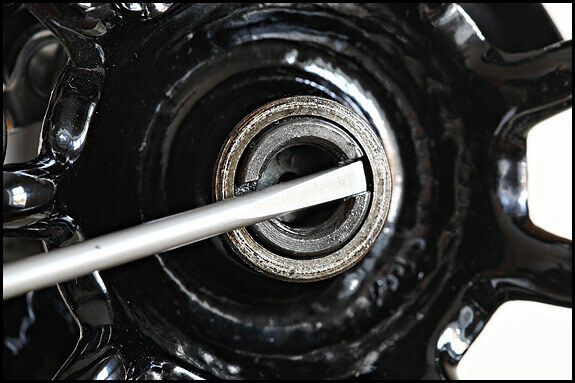 Note that the handwheel is fitted on the same shaft. It doesn’t go round with it, though, because it’s not fixed to it. If you gave that handwheel a spin, it would just rotate on the shaft, which would stay put, as would the washer (if you put a finger on it to stop it falling off the end). Just to labour the point, there’s no connection here between the handwheel and the shaft, so turning the handwheel isn’t going to turn the shaft, which isn’t going to move your needle up and down. As shown in that picture, the motion is stopped. That’s how things are when you’re bobbin-winding. 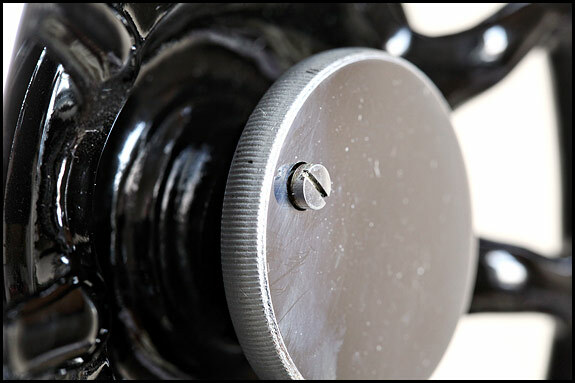 Now, if you replace the stop motion clamp screw (the chromed knob) and tighten it up, you’re back to normal – rotation of the handwheel drives the shaft which drives your needlebar up and down (and your feeds dogs backwards and forwards). That happens because tightening up the stop motion clamp screw clamps the handwheel to the shaft, so that whatever’s turning your handwheel also turns the shaft, and you can start sewing. That’s an exaggerated cross-section through the clutch area, and this is a simplified explanation. The purple’s the chromed knob, and the red’s the important bit – the stop motion clamp washer. In the diagram, the knob is unscrewed as for bobbin winding i.e. the motion is stopped. Nothing’s held tight against anything, so when the handwheel turns, it just spins round on the shaft, which stays put, as does the washer and the knob. All that happens is that the handwheel turns on the shaft. Nothing else moves. 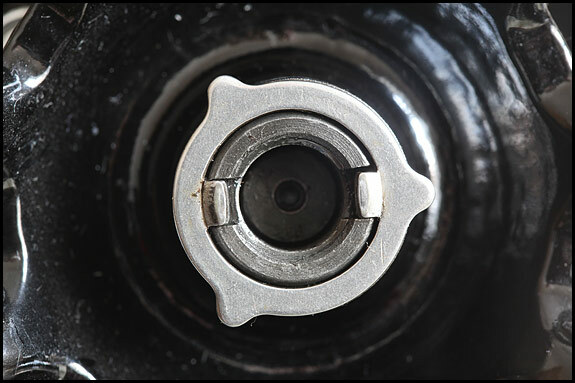 As we saw earlier, the washer is connected to the shaft by those two projections which sit in slots in the end of the shaft, such that if the washer turns, the shaft must too. Those two projections are so arranged that while the washer can’t rotate about the shaft, it can move along it, but only very slightly. Now imagine that purple knob being shoved hard over to the left, so it closes up the tiny gaps between itself, the washer, the handwheel and that step in the shaft, and squashes everything tightly together. Squash hard enough, and you have a handwheel which is clamped to the shaft. 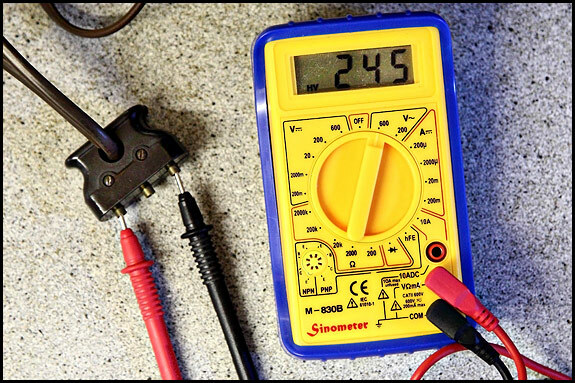 In practice, your stop motion clamp screw does the squashing. Tighten it up, and handwheel, knob, washer and shaft effectively become one, so turning the handwheel turns the shaft which makes your needle go up and down. That’s what happens every time you change from bobbin-winding back to normal sewing, and the key to it all is that washer. Well, we’ve seen worse fluff than this behind a 99’s faceplate, but we’ve never before found a press stud in there when we started cleaning one out. I think they’re called poppers or snap fasteners in other parts of the world, but whatever they’re called, I doubt they’re often found inside sewing machines. The arrow’s pointing at half of this one, by the way. The other half was deeper inside, behind the needle bar. That has got to be a bored child, hasn’t it? I’ve been asked to do some stuff on oiling vintage Singers, so I’d best get started! In order to oil your old machine, you need three things. You need the right oil. You need a means of getting the right amount of the right oil in the right place. And you need to know how much of this right oil to put where. OK, you also need some kitchen roll, loo roll or whatever to mop up drips of oil which didn’t end up where you wanted them to, so maybe we ought to make that four things. Let’s start with the oil. Don’t use 3-in-1 oil. 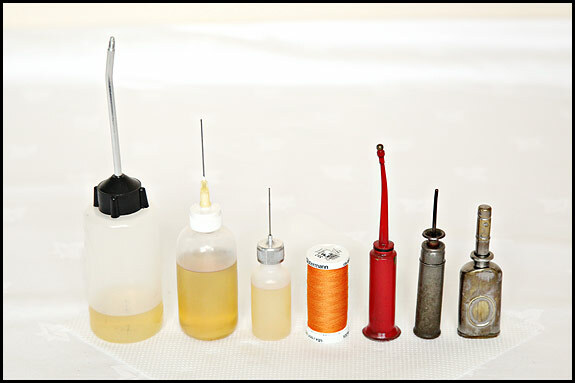 You need good quality sewing machine oil, not 3-in-1 oil. Proper sewing machine oil is very thin/runny stuff indeed, and you get it online or from your friendly local sewing shop if you’re fortunate enough to still have one. They won’t sell 3-in-1 oil, which is a Good Thing, because you don’t want 3-in-1 oil. Or olive oil, as was used on the last 66K we bought. Not WD40 either, or anything which might get used on a car, motorbike or boat, like 3-in-1 oil. That is not what you want. 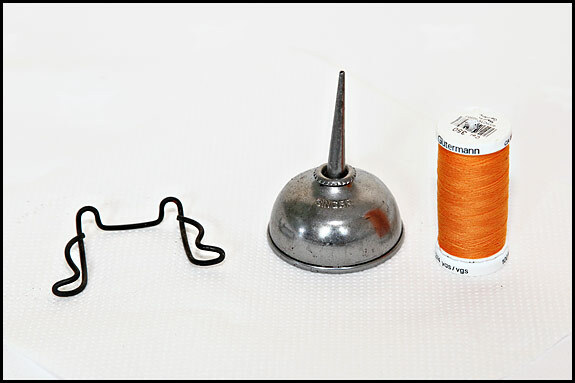 Despite what it says on the tin, 3-in-1 oil is not ideal for sewing machines. Far from it. It is evil. If you do use 3-in-1 oil, horrible things will happen to your sewing machine, the birds will stop singing and you’ll never win the lottery. We buy our nice sewing machine oil by the litre from an industrial sewing machine supplier, but you can get 125ml (I think) bottles of kosher Singer oil online including p&p for much the same price as most shops charge for it (around £4) and that will last you ages. That one fastens to the case by screws through those two upright loopy bits at the back of it, and if it’s been strained open a bit it will also hold the small green Singer oil tin. Incidentally, one reason why the clips are missing from many old cases is that they can put a nasty old scrape in the finish of your machine if you’re not careful when putting it in the case or taking it out – particularly when they’re on the inside of a bentwood case. However, if your case is missing the oiler/oil tin clip and you want to replace it, as far as I know the only way to tell which type it originally had is to work out which are the holes made by the clip screws. If the hole centres are 30mm apart horizontally, you need the clip shown above. If there’s two holes one above the other, you need the flat spring steel type which takes the green oil tin. Two holes not 30mm apart means you need the black sheet steel queerthing which unfortunately I haven’t got a picture of for you. OK, back to your brand new bottle of Singer oil. When you take the top off it, you need to cut the tip off the spouty bit, and for that you need a clean cut very close to the top. Cut it too far down and the hole will be too big, your oil will go everywhere and you won’t half grumble. Do that right and you’re in business, although if you’re really keen on maintaining your machine, sooner or later you’re going to want something which gives you better control over how much oil you deposit where. What you will want is called a precision oiler, which you get online or possibly from a fishing tackle shop (they’re used by anglers for oiling their reels, or whatever you call the wossname on the rod that the fishing line is wound on). 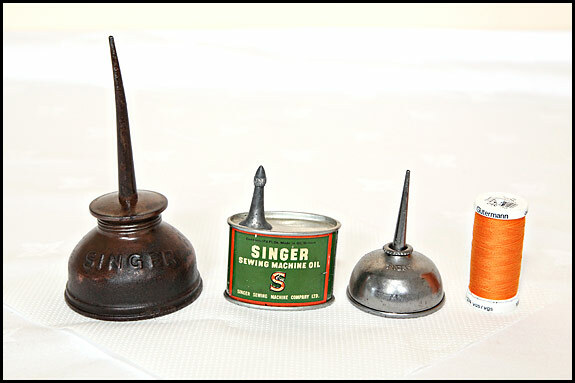 Now, I was going to say that we have here, from the left, my large, medium and small oilers, a reel of Sew All, then three common types of period oiler. Then it occurred to me that I could, for the benefit of our militant feminist reader, say that left to right is Mummy, Daddy and Baby oiler. But actually it’s good, better and best oiler, so let’s stick with that. Good oiler is a regular fixture on Ebay.co.uk, and the tiddler’s on Ebay.com. Better oiler took a lot of finding on Google and I’m currently trying to get a few for sale, so hopefully more about that one in due course. In use, better oiler is just as good as best oiler and it’s cheaper, but best oiler’s made just that bit better and I like that. The red oiler was hiding in the bottom of a cabinet we bought ages ago and would be fine if it didn’t leak, as would the Perfect Pocket Oiler next to it. That also came with a machine but its cap didn’t, and that one’s quite common. You even see it branded Imperial Typewriter Co. The one on the right’s a lovely little thing which we suspect is American, and which would be a delight to use if it didn’t leak like the other vintage ones do.